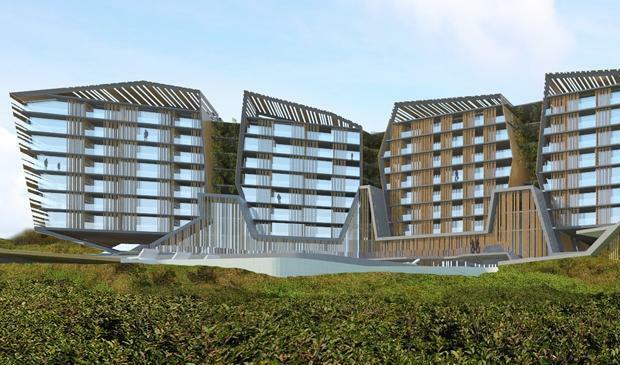 The Sunshine Coast Council has overwhelmingly voted to against changing the town plan in a move which ultimately blocks the proposed Sekisui House hotel and residential development near Coolum in its current form. The decision to uphold the current planning scheme passed in a resounding 10-to-one vote amid a tense meeting. Mayor Mark Jamieson said the social and environmental impacts of the proposed Sekisui House development (pictured), which included a beachfront hotel, residential, and retirement and aged care facility, outweighed any economic gain when considering his vote, the Sunshine Coast Daily reported. Most of the buildings in the proposed development exceeded the four-storey height limit and density for the area, meaning the plan would need to be amended to let it pass. Mr Jamieson said that on balance, it was not considered appropriate to propose an amendment to the planning scheme on the basis of the material submitted and the range of other considerations that Council had appropriately taken into account. "We have not seen a five-star or premium resort built since the late 1980s," he said.